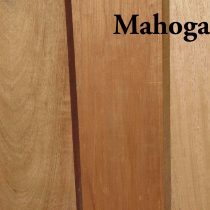 Our Mahogany is usually Honduras Mahogany but can sometimes be African Mahogany, depending on availability of Honduras Mahogany at any given time. Honduras Mahogany is found in central and northern South America. When cut, the color ranges from yellowish to salmon pink. As it matures, it darkens to a deep red or brown. The grains can be straight, curly or wavy. It is used for furniture, cabinet making, musical instruments and boat building. S4S means this hardwood has been surfaced on all four sides. This board has a cleaner appearance than S2S1E. Available in 1/4″, 1/2″, 4/4, 5/4, 6/4, or 8/4 thickness, 1-1/2″ to 6-1/2″ wide, and 3′ to 8′ long.